I've been busy, busy this week! Cooking, baking and cleaning - oh my. Precious old friends are on their way to Boone as we speak. Nan and Dindy have been dear friends for about 35 years. Since many miles separate us now that Donald and I are living in Boone, we don't see as much of one another as we once did. But, the friendships - as do all truly true friendships - have survived and those lovely and fun girlfriend feelings have not dwindled a speck. I do dearly love these women. And I've worked my buns off this week to prove it! (See now - When you're REALLY good friends, you get away with saying stuff like that and everyone understands it's all in fun). 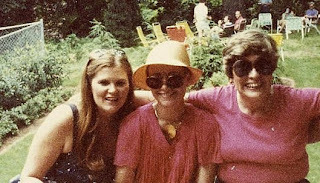 This is Becky, me and Nan during the summer of 1981. Becky isn't going to be with us this weekend and we will miss her! But. Another time. And here's Dindy and me (again! ), and Beck (again!). 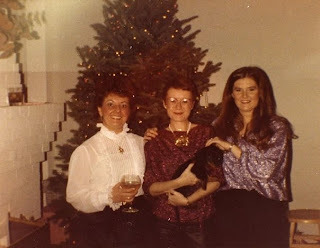 This was taken during Christmas 1981. And here's Nan and me and Dindy this past Christmas. And I'm betting I'll have a few more pictures to add in a few days . . . Here's a couple of recipes. Good "Girlfriend Weekend" recipes! Enjoy!! We're having a Broccoli Chicken Braid tonight since we're not sure what time we'll get around to eating. This is easily made ahead, tastes scrumptious and it's pretty to boot. Unroll crescent roll dough, and arrange flat on a medium baking sheet. Pinch together perforations to form a single sheet of dough. Using a knife or scissors, cut 1 inch wide strips in towards the center, starting on the long sides. There should be a solid strip about 3 inches wide down the center, with the cut strips forming a fringe down each side. Spread the chicken mixture along the center strip. Fold the side strips over chicken mixture, alternating strips from each side. Pinch or twist to seal. Here's a recipe I love. I cut this out of Gourmet Magazine many years ago. (MANY years - like maybe 30). I only make it for my very most special friends for very special occasions. 20- 25 servings (if this is too much for your girlfriend weekend, make it anyway - cut the loaf in half and freeze for another girlfriend weekend later on down the road). and I've made us a pound cake. But of course! Y'all know how much I adore pound cake! Preheat oven 350 degrees. Cream butter and sugar with an electric mixer. Add eggs, one at a time mixing on medium speed. Combine milk and lemon extract in a separate bowl. Combine baking powder and three cups of flour in a separate bowl. While running the mixer on low speed alternately add the wet and dry ingredients. Mix until smooth and well combined. Fold in lemon rind. Toss the blueberries with the remaining 1 cup of flour and gently fold into the batter. Pour into a greased and floured bundt pan. Bake for approximately one and a half hour, cool for 10 minutes, then turn out onto a platter. This makes a delicious breakfast bread or a mid afternoon treat with tea or coffee. And there's a pitcher of Iced Latte chilling in the fridge . . . Brew coffee using 12 cups o water. Stir in sugar untl dissolved. Stir in Half & Half, milk, and vanilla. Chill. Serve over ice. okey doke - off I go to get ready for my girlfriend weekend! Oh, yummm! And me with only leftovers for dinner. Going to have to try these! Oh these sound wonderful. Thanks for the recipes! The country pate was my favorite in the line-up. Sounds like a great time was had by all and plenty of good food. Hope you are enjoying this cool weather. Vicki - I never ever bake a pound cake that I don't think of you, and that's the truth. Elizabeth - I am in Boone, NC! And my mom is in Blowing Rock. Dindy and Nan, who were here for the weekend, are great buddies with my mom, so a lot of our weekend was spent at her place. AND, Saturday was Art in the Park day in Blowing Rock, which we (of course!) attended ad loved. One of my favorite things to do. Sam - the Country Pate is to die for. Let me know if you fix it - I'm always interested in hearing how people like recipes that I've passed along. I am LOVING these cooler temperatures! Putting on a light jacket in the mornings pleases me. 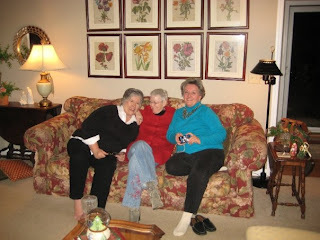 Kaye, when you get together with special old friends such as these gals, it seems like time has stood still and you pick up right where you left off - reminds me of a soap opera - you tune in years later and it's as if you were here yesterday. I've got to make that pate, as I said earlier. Thanks for your fun post on my blog and for introducing me to "Being dead is no excuse - the official Southern ladies guide to hosting the perfect funeral." I know I'm going to love it, because I grew up in south Arkansas, not very far from Greenville, Ms and the Delta. I couldn't help but smile when I saw the deviled eggs on the cover, but inside I could taste the tomato aspic with homemade mayonnaise (the only kind we ever ate in our house). My gosh - the book has six recipes for pimento cheese, a southern favorite. She describes southern funerals exactly as they were (or still are in some parts of the south). Everyone does go to the house afterwards for the food and company. I'll be buried, along with my Yankee husband, in the same little southern hometown cemetery where my great-great grandfather is buried with his Civil War headstone. Through the years the lawn mowers have nicked its corners, but I know he'd still be proud of it. Thanks for stirring up some great old memories.